A cry for help from afar! 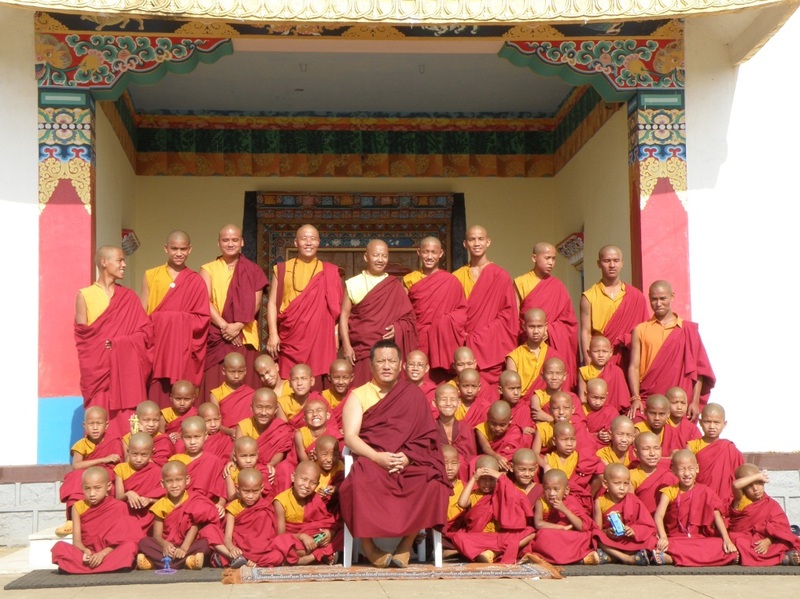 Tana Monastery is now a home to 60 young monks, whose ages range from 5 to 17. There they receive food, clothing and shelter, in order to study the Buddhist doctrine. These young monks come from extreme poverty, where their parents can hardly afford to provide shelter and food for them. Their existence depend fully on donations as Tana Monastery is situated in a very remote wild life restricted hilly area in Karnataka State, Kollegal Taluk, South India, about 5 to 6 hours of very rough car or bus ride from the International Airport of Bengulru, with frequent water and electricity restrictions. In late 2010, the Abbott of Tana Monastery, Tulku Pema Rinpoche had to leave for Sherabling Palpung Retreat Centre in Himachal Pradesh, North India to undertake a mandatory retreat of 3 years, 3 months and 3 days, hence the difficulty of getting sufficient funds for the young monks, whose subsistence has become acute. The Monastery needs your help to assist in the young monks’ subsistence and it is hoped that you can help in this fund raising to make a positive difference in the lives of these young monks and make for a better future and place for our children, grand children, great- grand children to live in. Rinpoche apologises for not being able to attend this charity as he is currently still in retreat in India. The proprietor, Madam Yao Yong Juan , has generously sponsored this lunch event; a heartfelt big thank you from the young monks of Tana Monastery. Please help by donating generously with a minimum of RM800 per table. The merits are plentiful, not forgetting to dedicate your merits to all sentient beings. We come to another year end and the monks of Tana Monastery India will be conducting the year end pujas stretched over 10 days; the Vajrakilaya Grand Fire Puja and Dorje Drolod Grand Fire Puja. These pujas are to clear obstacles, thanksgiving and to have a better year ahead – 2014. 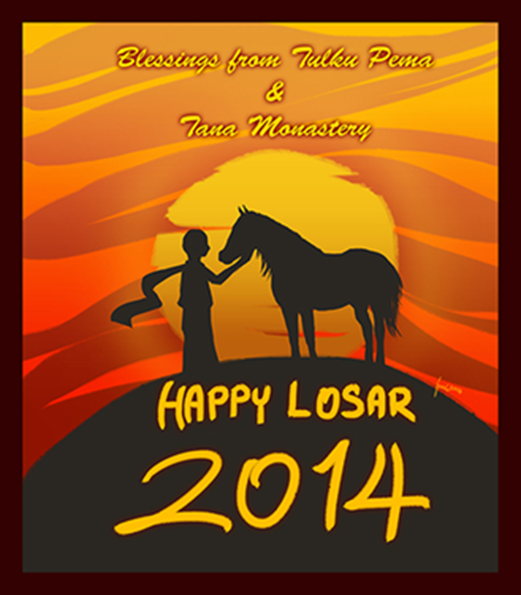 This year the Tibetan Losar (Tibetan New Year) falls on 2nd March, 2014. Kindly email me at kathryntana@gmail.com or sister Poh Chwee at pohchwee@hotmail.com after you have remitted your contribution to enable us keep track of your contributions. Please do not omit to email the names of participants and their contributions as we will be compiling them to be sent to the Monastery by 26 January, 2014. A Puja is a Buddhist ceremony. Vajrakilaya is Buddha manifesting particularly the enlightened qualities of the complete reversal & utter destruction of ignorance and of negativity, which are synonymous & synchronous with the complete expansion and revelation of wisdom and compassion that is Buddha. Vajrakilaya was one of the main practices that Padmasambhava transmitted to his students. The practice of Vajrakilaya has great significance in that it is what Padmasambhava last performed in Nepal before his triumphant arrival and victorious introduction of Buddhism from India to Tibet in the 8th Century AD. Following the example of Guru Padmasambhava and many superb lineage masters, we perform Vajrakilaya to overcome outer, inner, and secret obstacles to Dharma practice and activity as well worldly activities. The Vajrakilaya puja performed before Tibetan New Year prevents the obstacles from the past year from carrying forward into the New Year. “Crazy Wisdom Vajra”, a wrathful manifestation of Padmasambhava and a subduer of demons. Guru Padma arose in the wrathful form of Dorje Drolod in the famous Tagstang or Tiger’s Nest Cave in Bhutan to subdue the negative and demonic forces of these degenerate times. Ferocious in expression, amidst a mass of primordial wisdom fire, he stands upon the back of a pregnant tigress who is the wrathful form of his Wisdom Consort of enlightened activity, Tashi Kye Dren, whose ferocity is unpredictable and wild. Dressed in a robe of brocade, his hair is red and curly, he has an overbite and fangs and wears a garland of severed heads representing the cutting of the 52 levels of dualistic mental-events. In his right hand he holds aloft a vajra emitting lightning bolts, and in his left a kila-phurba, a three-sided ritual dagger which severs the three poisons that are the source of all suffering. The ferocious expression he wears while riding a pregnant tigress who is munching on a corpse makes for a menacing figure. His body is dark brown and surrounded by a halo of flames. The 7 days Dorje Drolo Puja helps to prevent the obstacles from the past year from carrying forward into the New Year. It will specially protect us from powerful demons. Thank you for your participation we would like to wish you all a very spiritually fulfilling New Year and may 2014 be a better, brighter and more prosperous year for all despite the tariff hikes. Namaste! Warmest Greetings to all of you! The Tana Monastery will be doing the lamp lighting and 100 Dieties Jang Chog Puja on Wesak Day (the threefold commemoration of Lord Buddha’s birth, attainment of full enlightenment and entering into Mahaparinibbana) – 24th May, 2013. It is a great opportunity to do something for the deceased and karmic debtors during this very auspicious period. If you wish to participate in the 100 Dieties prayers on Wesak day, please remember to submit the name of the deceased or the living donor’s name for karmic debtor by informing us at pohchwee@hotmail.com or kathryntana@gmail.com. The donation for the puja is any amount. Once you have made your remittance, please don’t forget to inform us the remittance details as well as all the donors names for the Puja. Closing date to receive all remittances: 20 May 2013. The 100 Deities are the attributes and activities of the 5 Buddhas and their female counterparts. They are the manifestations from the pure nature of our minds, and remain within us in the form of 5 faculties, 5 elements and 12 sources of perception and so on. By relying on the practice of the 100 deities or hearing the mantra, seeing the mandala and picture of the 100 Deities, one may either instantly or gradually realize the nature of one’s own mind is inseparable from the perfect wisdom of the 100 Deities. During the performance of Jang Chog puja, the 100 Deities are invoked and various types of offerings are made to them. The merits accumulated from these offerings are dedicated to the deceased and karmic debtors to help them in their purification and liberation. The prayer is also an offering of assistance to those in the intermediate or Bardo state to show them the path to liberation and an accumulation of merit. At the end of puja, the paper tablets of the deceased are burnt away. The fire used in the burning symbolizes the wisdom of the 100 Deities; the burning of the tablets symbolizes the cutting of the attachment of the deceased to a “self” which is the cause of their own suffering. Through the prayer and the ritual performed, the consciousness of the deceased are merged and become inseparable from the wisdom of the 100 Deities, thus they are liberated. By practicing the 100 Deities, like all tantric practices, one is able to purify one’s own mind’s manifestation and transform ordinary thoughts to extraordinary thoughts that leads to recognize the true natue of one self and nature of everything. The Monastery conducts the following pujas for the whole year in addition to the daily Green Tara and Mahakala pujas. Those who are interested to participate in any of the pujas, you are welcomed to make a donation or sponsor the whole puja. Please email: kathryntana@gmail.com or pohchwee@hotmail.com. In order to propagate the Buddha Dharma and to benefit all 1008 sentient beings, we have 1008 Buddha Shakyamuni Statue (8 inches) in the main Shrine Hall of Tana Monastery (in India). The sponsorship for each statue is RM 688.00. We humbly seek your most generous support in this project. Your kind donation would give the Sangha a more conducive environment for them to learn and practise the Buddha Dharma. The Buddha said: “In future when sentient beings make offering of Buddha statues, the amount of merits is equivalent to making offering to me”. Offerings and prostrations made to the Buddha Statues are the same as being done to the Buddha. They become immediate cause of enlightenment, alleviate sufferings, induce happiness and bring about a good rebirth in many lifetimes. One gains the merits as long as the Buddha statue lasts and would also gain merits whenever others pray to it. Therefore, those who contribute to the virtue of building the Precious Buddha Statues would receive immeasurable merits and bonding with the Buddha. Click here to download the 1008 Shakya Muni Buddha Sponsorship Form in DOC format. 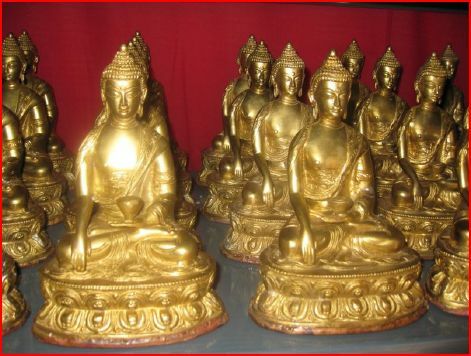 Click here to download the 1008 Shakya Muni Buddha Sponsorship Form in PDF foramt.